By now, you should be aware of the biggest problem for most golfers. This is visible in the person who is asked to play in the charity golf tournament, picks up a club twice a year, struggles making contact with the ball, feels embarrassed and feels they should have just stayed at the office. This is visible in the player who tees it up in their weekly foursome and continues to be beaten by his friends that he knows he can beat. This is visible in the player who plays military golf – hits it left, right, left, right, left! This is visible in the new player to the game who is taken to the driving range, given a driver and struggles getting the ball airborne. This is visible in the junior golfer who is not able to get the ball in the air and wishes they could just go do an activity they are good at. This is visible in the parent trying to determine which golf program is best for their child and has no clue where to start. Like you, most people with interest in this game wants to have the support and direction to get better . You are not the only golfer searching books, Golf Digest or YouTube looking for the next magic tip. You are not the only one getting ‘advice’ from family and friends about what you need to do. You are not the only parent wondering how to determine which golf program is best for my junior. Let’s take the #1 complaint of golfers – ‘I am inconsistent’ and start the adventure to solve the problem. Inconsistent golfers often experience several inconsistencies in the game of golf. Inconsistent scores – one day 85 followed by the next day of 100! Inconsistent distances with each club – one swing the 8 iron flies 145 yards followed by a 125 yard result. Inconsistent shot results – the next hit well, the next barely gets past the forward tees. WHERE THE CLUB STRIKES THE GROUND! Recall most golfers think they need to get ‘under’ the ball to get the ball into the air. This often leads to the club striking the ground behind the ball or not hitting the ground at all. 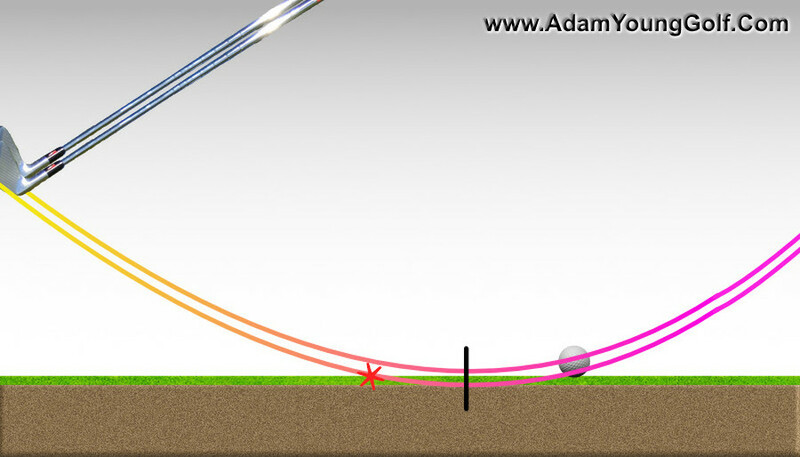 This image from a PGA Professional I follow, Adam Young, shows the beginner or struggling golfers result. Look familiar? Have you experienced this or seen a junior do this? The result is often either where the club hits the ground, removing a big divot and the ball goes no where OR the club misses the ground and contacts the middle of the ball leading to a low rocket ball that could go any where. The result can be embarrassing, lead to frustration and lead to self-doubt. Remember the result for the beginning and struggling golfer is due to MISUNDERSTANDING what needs to happen. Simply the UNDERSTANDING needs to be provided by a guide. 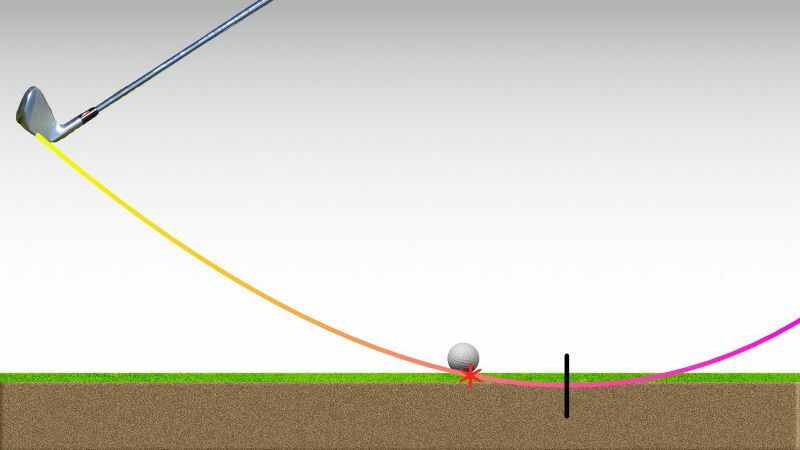 So now the picture below shows what SHOULD HAPPEN – notice that the ground contact is AHEAD of the ball with the lowest point some 4 to 5 inches ahead. What needs to happen is the club is GOING DOWN through impact! You know have the UNDERSTANDING of how the club contact the ground in order to get the ball in the air. Good contact can be achieved. Remember the club needs to be travelling down at impact to get the ball to go up! Most golfers, whether a junior or adult, will experience the Compression Board in our environment. This training tool provides the player feedback that can make change occur faster. Here is a great resource – a fellow PGA of Canada Professional describing the origin of the Compression Board and how the board is used to help golfers of all levels – from new players to seasoned professionals. The basic idea behind the Compression Board…promoting proper contact with your irons and short game shots. As shown in the video, the club needs to go DOWN through impact to get the ball airborne. I have had many juniors and adults change the ball flight in less than 10 minutes using the board. The key is first the UNDERSTANDING followed by the DOING with FEEDBACK. If you want your inconsistency turn into consistency, are you going to find it on your own or with a guide? The guide will provide the knowledge and experiences that will lead to your desire result. The guide will provide the solution to the most common misunderstandings. The guide will support you along the adventure to solving your problems. The guide will provide a ‘road map’ to improving your game. The guide will talk fact not opinion. How do players get better? Just knowing what causes the shot you experience is the starting point. Most golfers don’t have a clue why their shot just went along the ground, or why the ball flew right into the trees or the next fairway. Are you like most golfers and searching for the magical tip or elusive secret to great golf? Are you like most golfers trying different methods in the hope of finding the right one? Don’t follow the pack – you can choose to take ownership of your understanding. I will show you how to improve them from a skill perspective. I will show you how to improve your technique to improve contact. I will help you with understanding the concepts. You will find out how the pros strike the ball so crisp and consistent. You will learn how ‘common myths’ are causing you to hit more fat and thin shots than you want. Do you want the want to take the first step towards more crisp and consistent shots?